Calling all windsurfers! PBSC is first and foremost an extremely friendly, family orientated sailing club with a gradually increasing number of windsurfers. We may be in the minority but what we lack in numbers, we make up for in enthusiasm and are always seeking to try and encourage our dinghy colleagues over to the ‘dark side’. 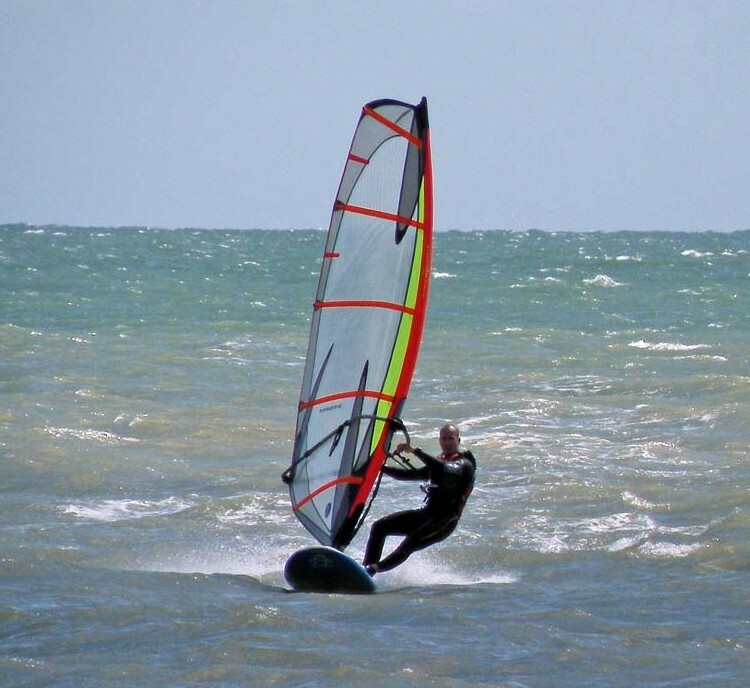 If you are interested in learning to windsurf, inland locations may be a better bet, but if you have already mastered the basics, then come and pay us a visit. Low tide, and light winds can be excellent conditions for your first adventure on the sea as the beach shelves gently and the bottom is sandy once the tide has gone out. The prevailing wind at PBSC is south-westerly, or cross-shore. The club benefits from the shelter of the Sovereign Harbour which allows us to get off the beach when windsurfers along the coast would be concerned about trashing their kit! The lee of the Harbour also gives you different areas to sail in, – calmer nearer the shore and much more ‘interesting’ further out. -During the summer months, we are frequently blessed with a sea breeze which can result in a decent force 4 and flat water conditions. The facilities at PBSC are all you could wish for, -hot showers, bar, decent food, storage for your kit and safety boats on hand should you wish to push your limits. Most importantly, you will be joining a growing family of friendly, enthusiastic windsurfers who are always willing to help their fellow converts out. See you on the water! For more information contact Matt Key via the Contact us page.